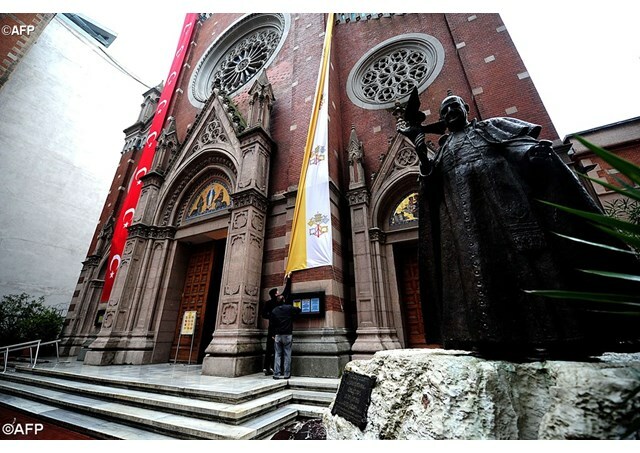 Turkey’s Prime Minister, Ahmet Davutoglu, has announced plans for a new church in Istanbul. It will be the first to be built since the founding of Ataturk’s republic in 1923. The first new church in over 90 years. Churches have been renovated in Turkey, but no new buildings have been allowed in nearly a century. Some of the churches have been converted to mosques and museum as a result. The church will serve some 25,000 Syriac Orthodox Christians. Decimated by massacres and then by migration to Europe, this group, which once flourished along the border with Syria, has long been campaigning for a church in Istanbul. The ruling Islamist Justice and Development (AK) party is facing growing criticism for retreating from its reform path. But it continues to win praise for its treatment of Christians. This is unlike previous governments which confiscated properties and did little to prevent pogroms. Last year the Syriacs were allowed to open a primary school where pupils will be taught in Aramaic, the tongue of Jesus Christ, for the first time. Thousands of church properties pinched by the state are being slowly returned. Formerly churches had to cut through endless red tape even to repair a leaky dome. In an unprecedented move, Mr Davutoglu has even appointed a Catholic Armenian, Etyen Mahcupyan, as an adviser. “These are welcome developments,” says Erol Dora, the first and only Syriac member of parliament, who was elected for the pro-Kurdish Peoples’ Democracy Party in 2011. “Yet the scale of the discrimination becomes obvious when news of a church being built is hailed as such a monumental event.” The Greek Orthodox Patriarch’s repeated appeals to reopen the Halki seminary, where generations of priests were trained, continue to fall on deaf ears. Suspicion of Christian missionaries is ingrained. And a campaign to convert the Aya Sofia museum back into a mosque is said to enjoy the backing of Bulent Arinc, the deputy prime minister.